This toolkit is only for English speaking users. All maps using this technique should be clearly marked so users know they must modify their system to gain the full experience. The modified files are taken from the US version of the game (which seems fully compatible with the UK version, but spellings are different). You must start with the template map provided. Custom messages and briefings cannot be added to existing maps. Every time you leave the game editor after editing a template map, it will lock itself again, no longer being editable. This means that you will need to unlock it with the map unlocker. The Toolkit will replace the on-screen messages from the Path of Peace Sim Campaign- while you can still play the Sim Campaign you should be aware the text will change. While the first thing you need to download is the custom messages toolkit, you also need the map unlocker. The map unlocker is a program which must be used on all template maps or toolkits, because the maps which you are working on will automatically lock themselves every time you leave the map editor. Once you've used the map unlocker on a map, you can load it in the editor as you normally would be able to. While you don't need to use the map unlocker to play the map, you will need to unlock it every time you leave the editor and want to edit it again. So if for example, you wanted to playtest your map, after testing you would need to unlock it again to be able to make changes to it. Secondly, you need to backup your game language file. Head over to the /Firefly Studios/Stronghold 2/i18n folder, and open up the file called lang.txt. The contents of this file should contain only a single word (in my case en) and this word corresponds to a file within the same folder with a .xml file extension (in my case en.xml). This is the language file the game loads and the file which you must rename. You can rename it to whatever you like, as long as you can remember what the original name was. Once you've renamed it, replace it with the file from the Toolkit. The next step is to create the landscape for your map in the editor. Once done, go to the mission editor. You will see 12 missions, and in each mission there are a few message events. The name of who will speak is present, along with a filename. The name of the person corresponds to the animated head which will appear during the game- these cannot be changed. 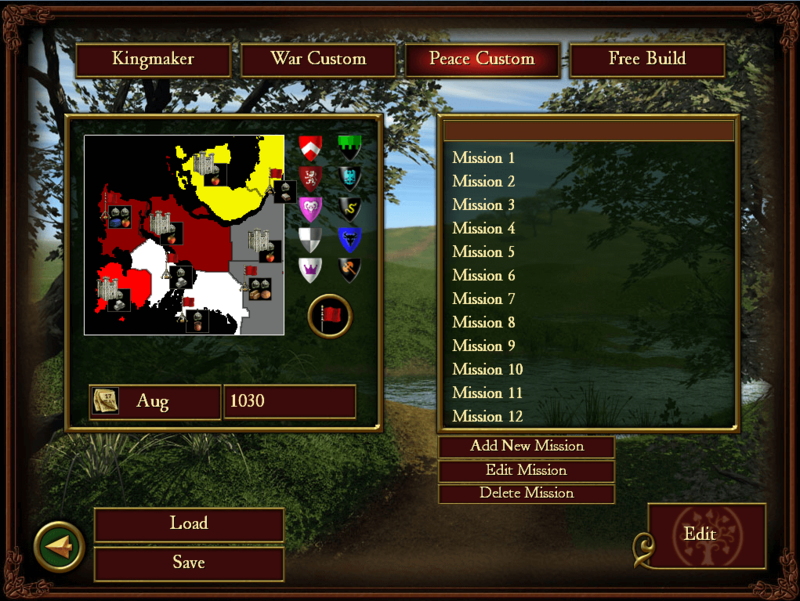 Look through all the missions and find which people best represent the people you want to communicate in your campaign. Delete all the missions you don't want in your campaign. Next, note the filename in each message event. This identifies which text entry in the XML file you need to change. You will need to change all of these occurrences in your language XML file to whatever text you want to appear. Save your map and close Stronghold 2. Now open up your XML file and edit it. You can use a whole number of programs, such as Microsoft Excel, but personally I use Notepad ++. You can either scroll down until you find the text you're looking for, or do a Ctrl + F search to find what you're looking for. The format of how the language is displayed consists of the identifier (text not displayed in-game) and underneath is the text which is displayed in game. You want to change the third entry. Repeat this for each entry which needs changing, then save and close your file. We highly recommend you update the sound files. You could record your own voice and convert it to an MP3, you may choose to edit some of the game sound files and blend them together. Or at the very least just replace the original sound files with blank ones so that the original speech doesn't interfere by playing over your text. You can use Audacity to edit your sound files and export them as MP3 files. 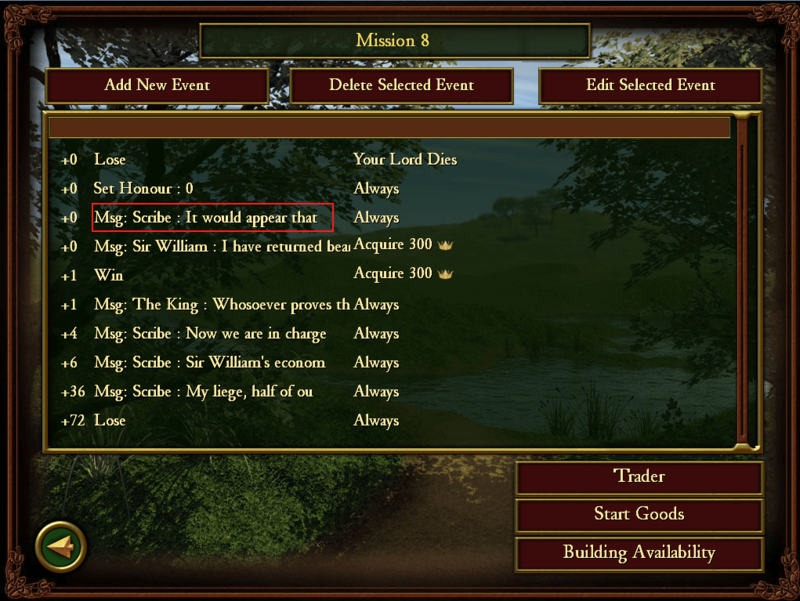 Once you have done this, head over to the /Firefly Studios/Stronghold 2/fx/speech folder and look for the files on your list. Note however, that they have a .mp3 extension instead of a .wav one. If you just want to play no speech, then append "backup" to each file you're looking for. The game won't be able to find the file it's looking for and just will play silence instead. To add your own files, rename them as backups, but place your own MP3 files in their place with exactly the same names as they had before. You will either need to add modification instructions for users stating how to do this when they download your file, or, if you are more technically inclined, you could create an automatic program to do this for users. If you fall into the latter category, personally I recommend Inno Setup Compiler which I have used on many of our game extensions such as the custom music pack. If you would like any help with doing this feel free to post a topic in our Stronghold 2 forum and I'll help you out where I can. Note: These missions relate to the total number of missions in your map. If you only have 2 missions, then only the first two files are relevant to you. After you've changed the messages, you will also have to update the speech files for these, in the same way we did above. Finally, package everything together, write some intructions on how to install your map, and upload it here to SHN! Let us all marvel at your resourcefulness!